The cosmetology operator course is the course to take to put you on the right track to work in the field of cosmetology. 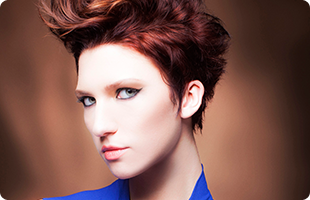 From day one, your Pivot Point training will prepare you for a lifetime career in cosmetology. * Exposito School of Hair Design uses Pivot Point teaching materials, student textbook, study aids, and practical training manuals for teaching the curriculum. Upon completion of the Cosmetology Operator Course,you will be able to perform all the manipulative skills of shampooing, cold waving, hair coloring, manicuring, facials, hair-styling, hair-cutting and all other related skills with at least a 70% accuracy on an exam given by the school before graduation. Upon completion of the Cosmetology Operator Course ,you will be able to comprehend all the technical information related to the above skills with at least a 70% accuracy on a theory exam given by the school before graduation. At the conclusion of the Cosmetology Operator Course, you will be prepared to pass a state exam given by the state exam administrator for a license to practice Cosmetology in the State of Texas. At the conclusion of the Cosmetology Operator Course, the successful performance on the State exam, and receipt of a license in Cosmetology, upon your graduation, you will be qualified to secure a position as a hairstylist, shampoo specialist, manicurist, facial technician, or hairstyling assistant with the skills he or she obtained. You will also be qualified to enter a course of Cosmetology Instructor training.